Imagine putting your out of office on and setting off on an adventure, driving past the most beautiful scenery in the world (at least that’s what we think!) From the stunning English hills, to the mystical Loch Ness; this ultimate road trip covers the full length of Britain. You may ask yourself, the full length of Britain, isn’t that a bit extreme? Maybe, but we promise you it’s worth it; every one of the 1000+ miles. After all, this trip is a well-known bucket list journey for a reason; it offers travellers a priceless sense of total freedom and independence. Especially if you travel with your home on wheels! So step away from the life you know for a while and give in to your sense of adventure. Pack your stuff, start the engine, and buckle up for the experience of a lifetime. Let’s start at the end. 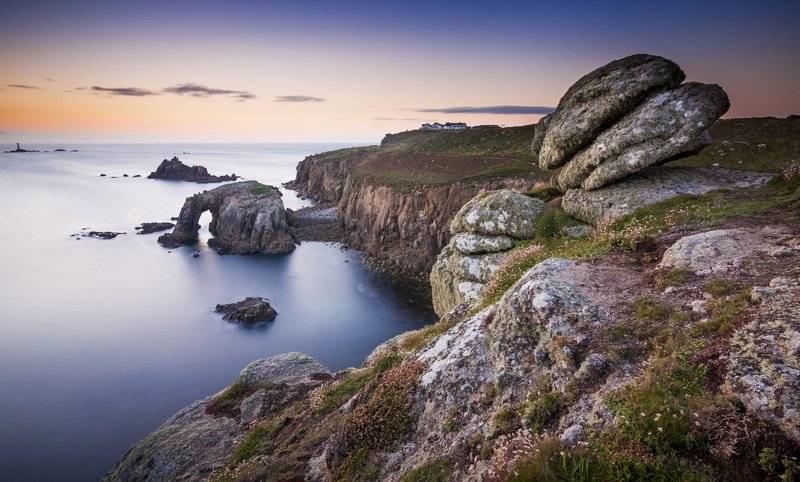 As in literally, let’s start at Land’s End in Cornwall, a famous landmark at Britain’s most south-westerly point. There’s no better place to start off your trip. When you stand on top of the 200-foot-high cliffs you can’t help but love the view. The seemingly endless Atlantic Ocean, the stunning Longships Lighthouse and the Lost Land of Lyonesse. According to urban legends, the latter of the three sunk into the sea many years ago. This legend definitely adds to the mystical feeling surrounding Land’s End. But we still have a long trip ahead, so now you’ve enjoyed the stunning panoramic views, you have the option to extend your stay by going to the West Country Shopping Village, otherwise, it’s time to start the engine again. You can choose to drive directly to Exmoor National Park, but the small city of Exeter is worth a small detour. This small but vibrant city has a rich history; it has both been a Roman fortified settlement and a religious centre. So unsurprisingly, the city has stunning architecture. 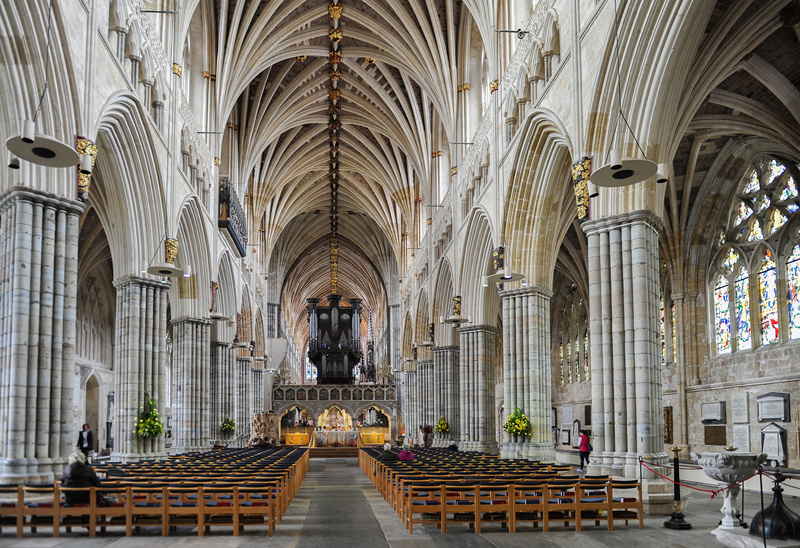 Especially the famous Cathedral of Exeter will leave you in awe: a must-see. After you’ve gotten your fair share of beautiful architecture, it’s time to enjoy nature’s own beauty. 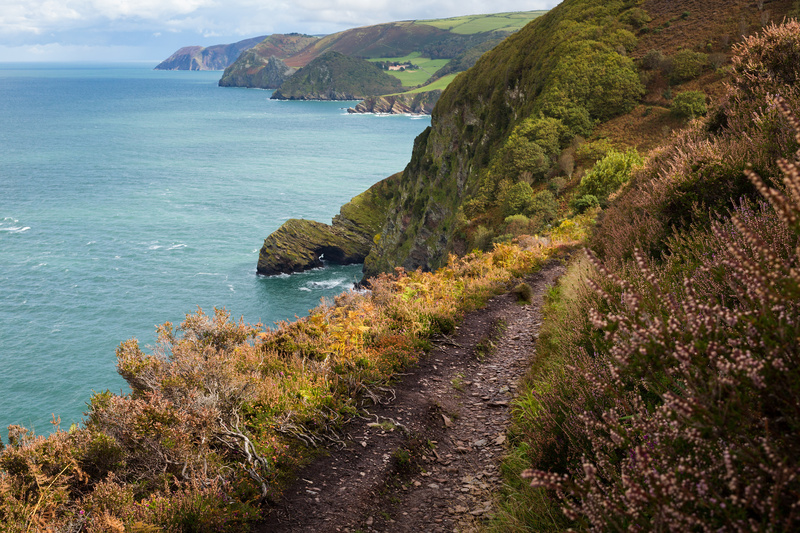 National park Exmoor is known to be one of the UK’s finest landscapes; it’s a unique landscape of moorland, woodland, valleys and farmland, shaped by both people and nature. And in addition to amazing wildlife like the red deer, you can also spot some of UK’s rarest butterflies and bats. A good reason to put on your walking boots! After your hike it’s time to leave this stunning park and return to the higher populated world. But not to worry, the road takes us through the Mendip; a breath-taking range of limestone hills! Next, the road leads us to the colourful Bristol. Bristol was voted the UK’s best place to live in 2017 for the third time in four years, and we can surely guess why. 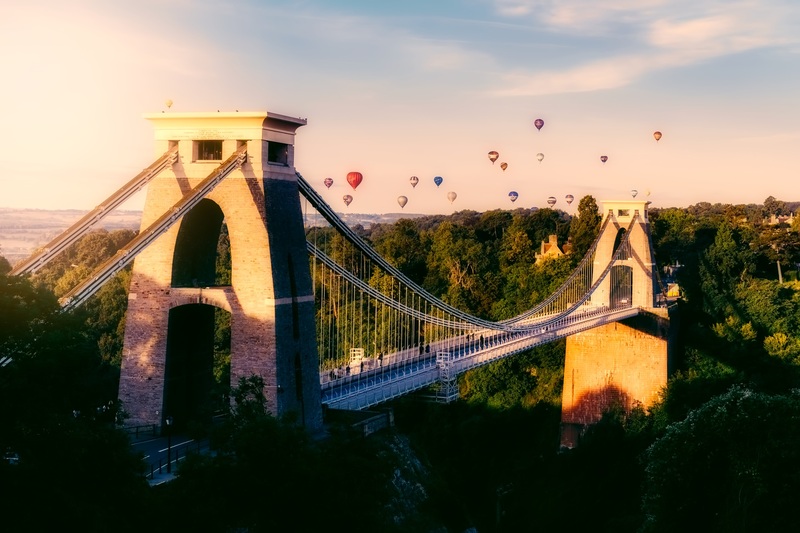 Amazing bars and restaurants, acres of parkland, cute little shopping streets and inspiring street art; Bristol has it all. And if you’re not afraid of heights don’t forget to visit one of Bristol’s most iconic sights: the Clifton suspension Bridge. After you’ve regained some of your energy by getting a good night’s sleep it’s time for a day packed with even more beautiful sightings. First stop of the day: Oxford! This iconic city has more to show than just the oldest University in the English speaking world – even though this is definitely a must-see. 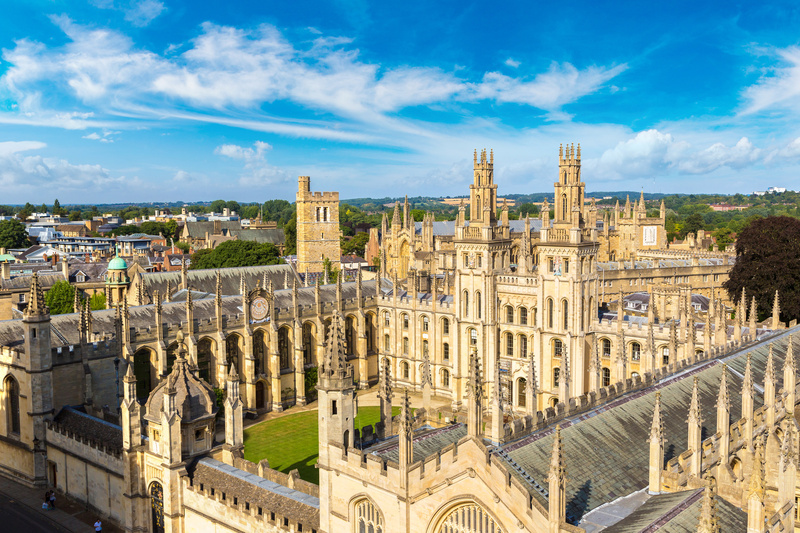 Oxford is the place to be, whether you are looking for places to shop, fascinating museums (like the world’s oldest public museum – Ashmolean Museum), or places to relax; there are plenty of parks, green spaces and gardens (the oldest botanical garden in the world!) The adventurers among us may even want to visit the UK’s only crocodile zoo! 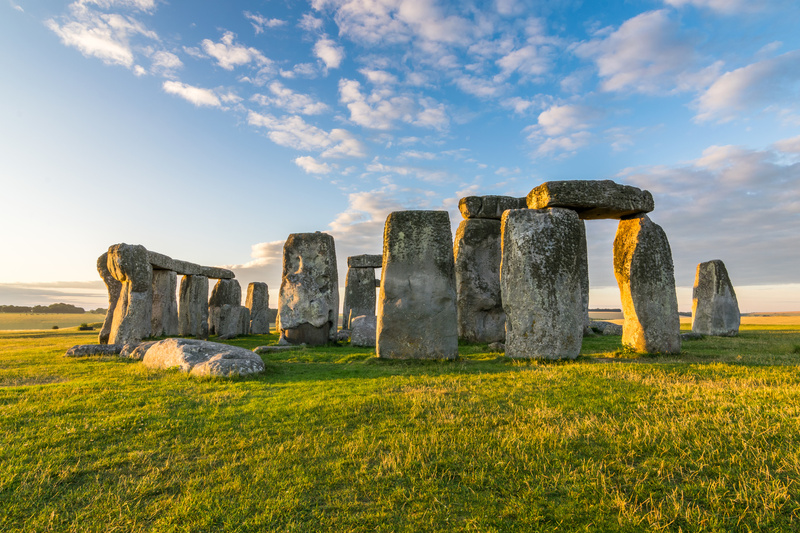 Additionally, you can also choose to take a small detour before entering Oxford and visit Stonehenge! Have you heard of that place before? It’s supposed to be pretty famous. Walk in the footsteps of your Neolithic ancestors and maybe come up with your own theory about why this monument was built. Because although many different theories have been put forward, it remains a mystery till this very day! The Peak District is one of the most visited national parks in the world, and there’s a good reason why. There are endless things to do here, so much you might want to stay a few extra days. 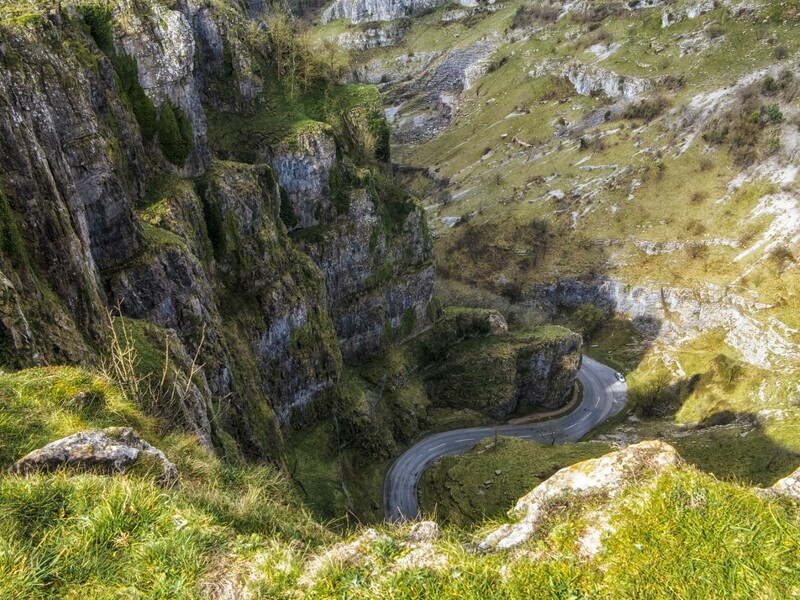 It’s the perfect area for hikers – there are moors and dales, rivers and springs– but you can also go rock climbing, visit country villages and explore the vast limestone caverns. Enough to explore, there are more than 100 caves and old mine shafts! When you’ve found your way out of the caves and into your vehicle you can continue to drive to the beautiful city of York! York has Roman roots and a Viking past and these historical influences can still be seen all over the city. When you walk the streets you might feel like you’re in the Middle Ages; the timber-framed houses, the traditional shop fronts and one of the most beautiful gothic cathedrals in the world. You can also visit more than thirty world-class museums and there is a festival for every month of the year. What we mean to say is, this thriving city is without a doubt worth the visit. 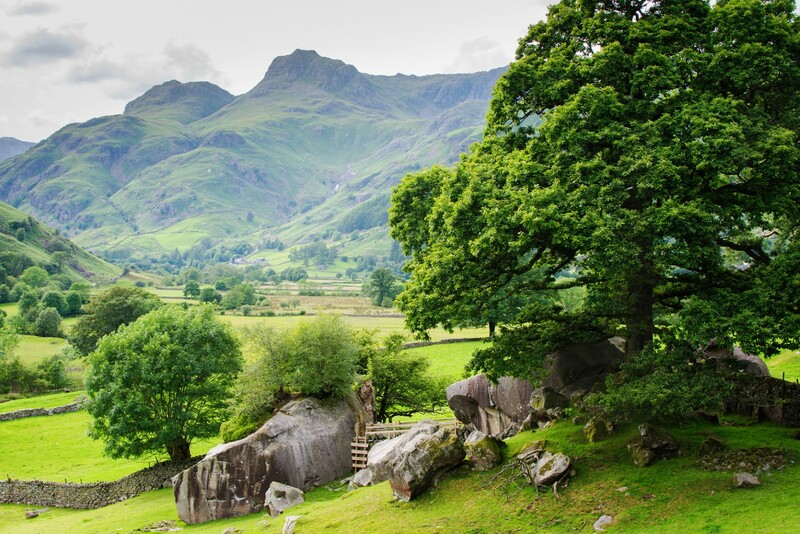 Just last year the Lake District National Park was awarded World Heritage status. 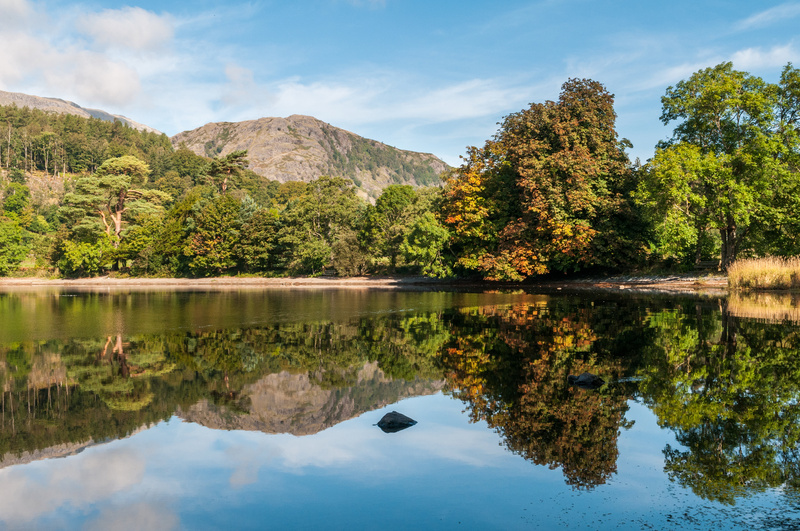 Every nature lover who’s seen the breath-taking woodland and hills, spectacular mountains and stunning lakes can’t help but agree with this decision. It’s no surprise that it is by far the most popular national park in the UK and attracts millions of visitors each year. There are a lot of things to see, but don’t forget to pay the impressive Scafell Pike (the highest mountain in England) a visit! Lake District National Park, the Yewdale fells in the background. DAY 5-6 Welcome to Scotland! Say Goodbye to England for now, because we’ve arrived in Scotland! The Galloway Forest Park is a worthy first stop in Scotland. This park has an outstanding variety of wildlife and is often referred to as ‘the Highlands of the Lowlands’. Enjoy the beauty of the ancient woodland, stunning scenery and the astonishing range of local wildlife. Whether you like walking, cycling, fishing or just relaxing: the Galloway forest Park is the perfect place. You can even choose to enjoy the magnificent scenery without leaving your motorhome by driving through the woods! Scotland has more to offer than just beautiful scenery. 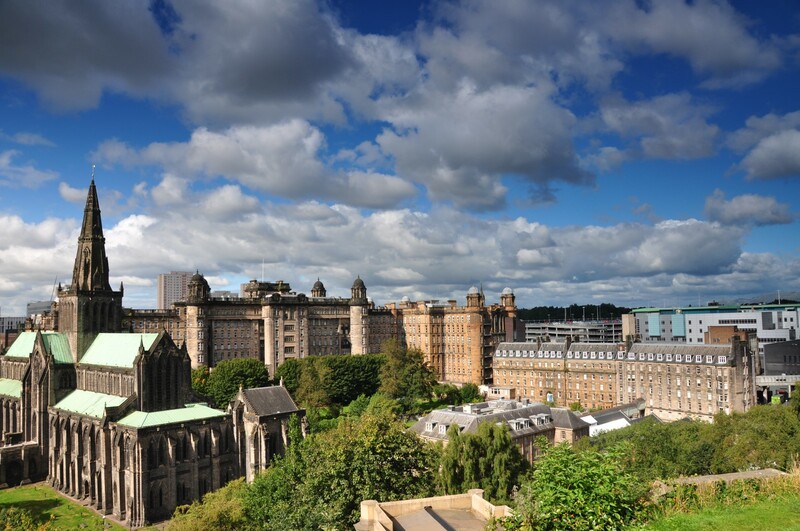 Although Glasgow was originally an industrial city, it is now home to world-class museums (like the largest museum in Scotland the Kelvingrove Art Gallery, you can find paintings of the greatest European masters here), vibrant festivals and one of the best live music scenes in Britain. It is also a shopper’s paradise, has a lot of high-quality restaurants and is known for its friendly people and sometimes irreverent sense of humour. The nightlife in Glasgow is also pretty exciting; and whether you plan to stay in or go out, do not forget to order a glass of the delicious Scottish malt whisky! From the exciting city centre of Glasgow we continue our trip to one of the most iconic and loved places in Scotland: Loch Lomond, the UK’s biggest lake. 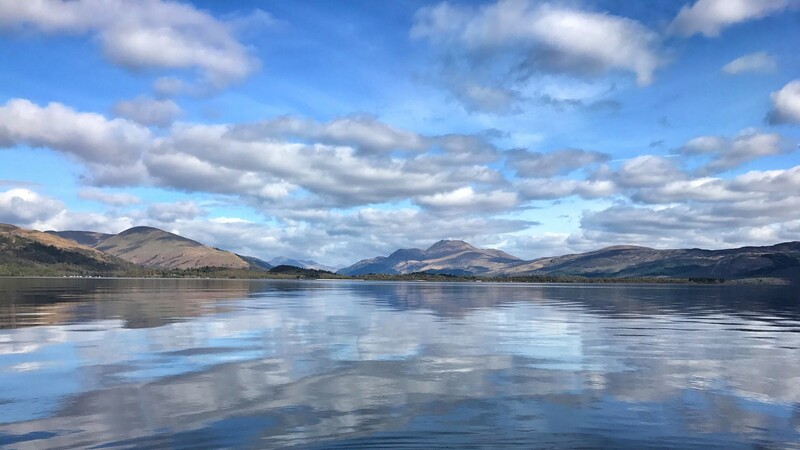 The enchanting loch can be found in the heart of Loch Lomond and the Trossachs National Park, surrounded by charming villages, countryside and hills. It’s the perfect place to escape civilization for a while, even though it’s only a one hour drive from the Glasgow city centre! The loch has a number of small islands that you can explore with a rented boat if you really want to leave everything behind for a while. Aviemore was once just a small town within the Cairngorm National Park, but it developed into a great destination for adventure seekers. In winter, Aviemore is known for being a ski holiday resort and in summer Aviemore is alive with adventurers taking advantage of the many activities around the area. You can visit some of Scotland’s most beautiful lochs, forests and mountains here. The Highland Wildlife Park is also worth a visit: you can visit Hamish, the first polar bear cub to be born in the UK for 25 years. If you want to raise your heartbeat a bit more you can also spend your time horse riding, clay pigeons shooting or white water rafting. No need to feel bored! Inverness is known as Scotland’s ‘Highland Capital’ and is both the largest city and the cultural capital of the Scottish Highlands. However, this cosmopolitan city still retains its lovely market town feel. Besides being ‘the Gateway to the Highlands’ Inverness attracts lots of tourists because of the legend surrounding the Loch Ness Monster, an aquatic being which according to legend inhabits Loch Ness, the lake that runs to the south of Inverness. So a trip to Inverness would not be complete without a visit to this magical place. Even if you don’t manage to spot this unique creature, you’ll definitely be able to spot the unique scenery! This epic journey has almost come to an end, but not without an amazing last destination! In the most northerly point of mainland Britain lies John O’Groats. 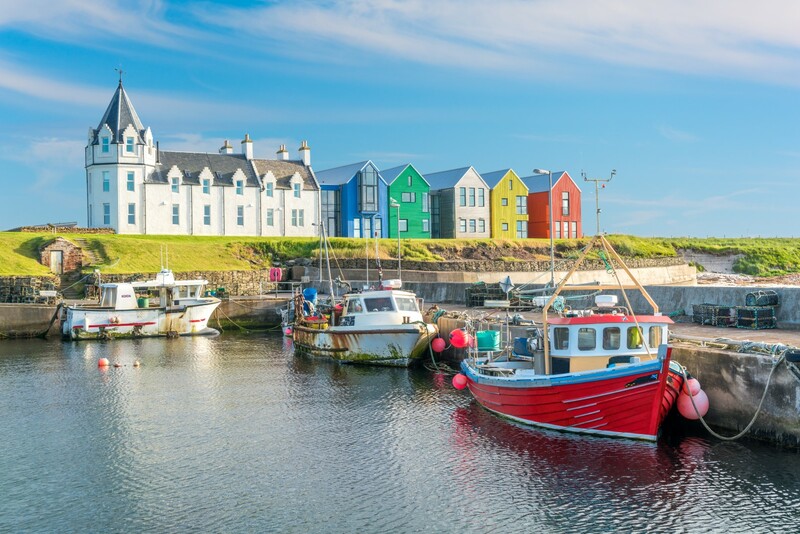 This special coastal village attracts large numbers of tourists from all across the world all year round, and again, we can see why. The breathtaking coastal walks, the impressive castles, the stunning gardens and of course the Pulteney distillery: this village is enjoyable for all. 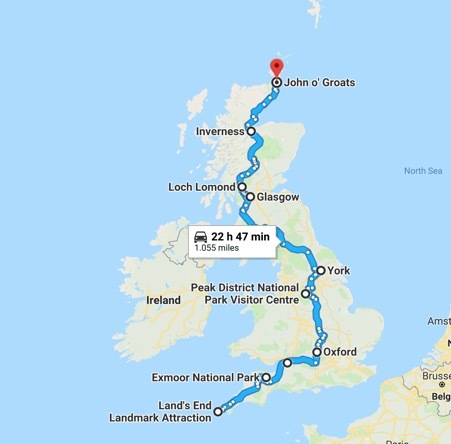 Additionally, John O’Groats lies on an amazing 500 mile driving route through the North Highlands. This route, known as North Coast 500, is famous for its remote, rugged landscapes. You might want to just drive around for a while to enjoy the unique Scottish scenery. And finally, what better way to end your trip by spotting the Northern lights? You might not have thought you’d be able to see them in Scotland, but because this village lies so far up north you have a fair chance of spotting them! Sadly, you can never be sure when you’ll be able to see this stunning natural phenomena, but you can improve your odds by signing up to Aurora Alerts to get notifications of when there is geomagnetic activity.